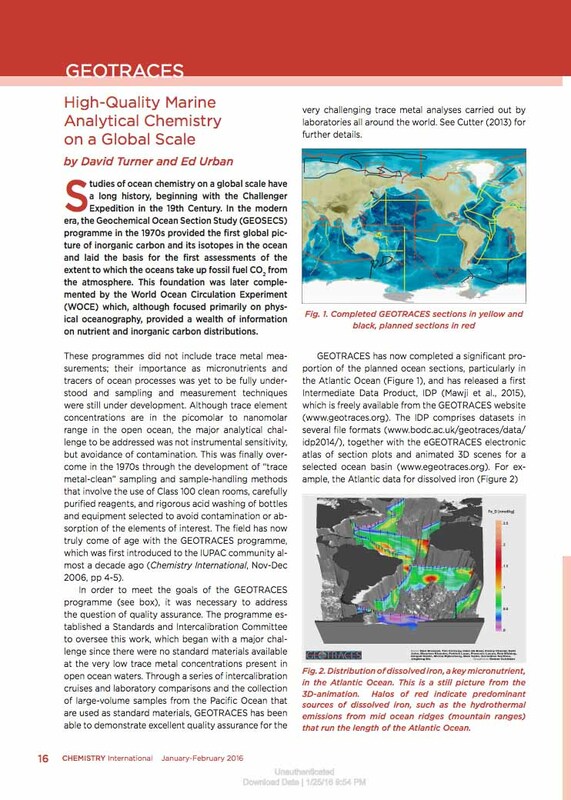 GEOTRACES analytical strategy is featured in Chemistry International, the newsmagazine of the International Union of Pure and Applied Chemistry (IUPAC)! Do not miss this article from David Turner (University of Gothenburg, Sweden) and Ed Urban (SCOR, USA). *GEOTRACES Sessions: A list of GEOTRACES and GEOTRACES-related sessions is available on the GEOTRACES website. *GEOTRACES Town Hall: "Opportunities to Strengthen Your Science (and Proposals) using GEOTRACES Data", Thursday, February 25, 2016, 6:30 PM - 7:30 PM (at Ernest N. Morial Convention Center, 228-230). *SCOR Booth: GEOTRACES will participate with other international projects in a booth sponsored by SCOR. Please stop by and visit! 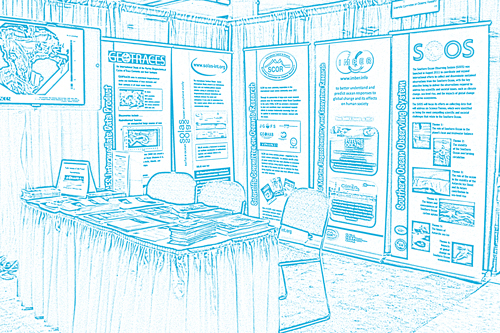 Figure: SCOR Booth at Ocean Sciences 2014. An special issue to celebrate the oceanographic career of Hein de Baar (GEOTRACES past SSC member) at the occasion of his retirement in November 2014 is now available in Marine Chemistry. UltraPac - Process Study (GPpr09), South Pacific. 08 January 2016 - 05 March 2016, HEOBI-Process Study (GIpr05), Indian sector of the Southern Ocean (around Heard Island). 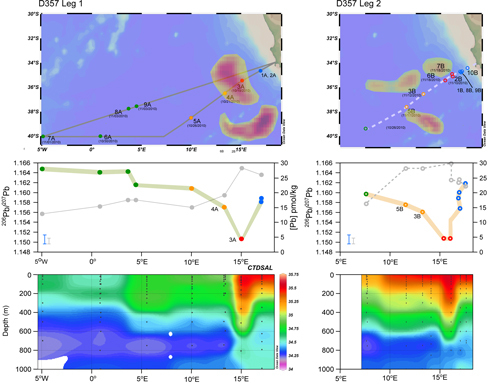 08 January 2016 - 15 March 2016, K-Axis Process Study (GIpr06), Indian sector of the Southern Ocean. Process Study (GApr06), Mid-Atlantic Ridge. 27 - 28 January 2016, Biogeochemical studies in the Siberian Shelf Seas Workshop, Kiel, Germany. 26 June 2016, Exploring GEOTRACES data with Ocean Data View, Nippon Maru Memorial Park, Yokohama, Japan (Goldschmidt 2016). 01 - 04 August 2016, Joint GEOTRACES/OCB Workshop on Internal Cycling of Trace Elements, Lamont-Doherty Earth Observatory, Palissades, USA. 21 - 26 February 2016, Ocean Sciences Meeting 2016, New Orleans, Louisiana, USA. 17 - 22 April 2016, European Geosciences Union General Assembly 2016 (EGU2016), Vienna, Austria. 26 June - 01 July 2016, Goldschmidt 2016, Yokohama, Japan. 07 - 09 March 2016, ESSAS 2016 Annual Meeting: Scientific Challenges in a Changing Arctic & SubarcticAnnual Meeting, Yokohama, Japan. - Gerringa, L. J. A., Rijkenberg, M. J. A., Schoemann, V., Laan, P., & de Baar, H. J. W. (2015). 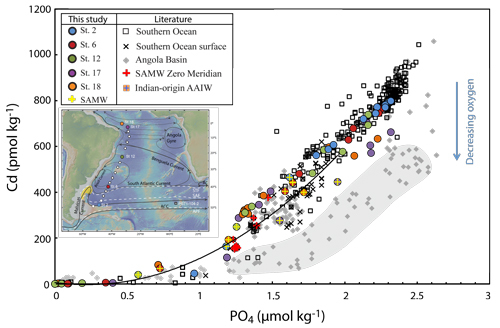 Organic complexation of iron in the West Atlantic Ocean. Marine Chemistry, 177, 434–446. doi:10.1016/j.marchem.2015.04.007. - Middag, R., Séférian, R., Conway, T. M., John, S. G., Bruland, K. W., & de Baar, H. J. W. (2015). 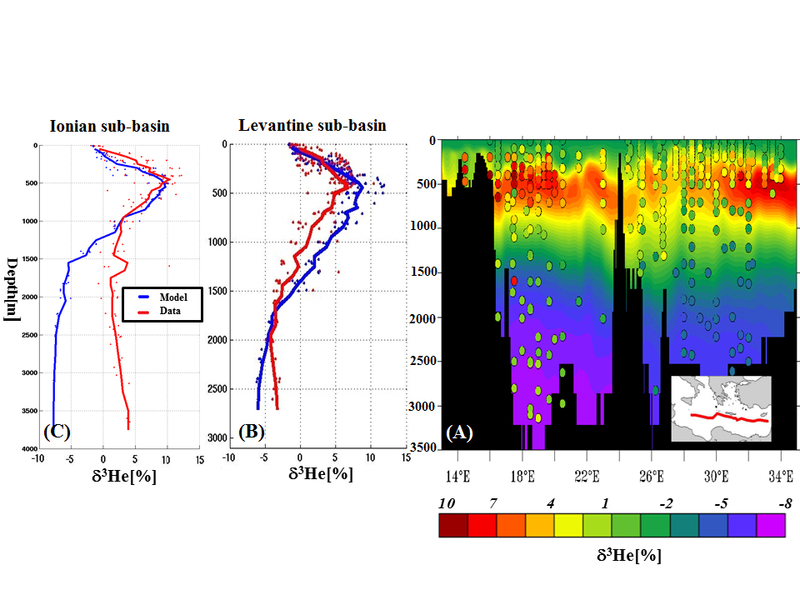 Intercomparison of dissolved trace elements at the Bermuda Atlantic Time Series station. Marine Chemistry, 177, 476–489. doi:10.1016/j.marchem.2015.06.014. - Rijkenberg, M. J. A., de Baar, H. J. W., Bakker, K., Gerringa, L. J. A., Keijzer , E., Laan, M ., Laan, P., Middag, R., Ober, S., van Ooijen, J., Ossebaar, S., van Weerlee, E. M., Smit, M. G. (2015) . “PRISTINE”, a new high volume sampler for ultraclean sampling of trace metals and isotopes. Marine Chemistry, 177, 501–509. doi:10.1016/j.marchem.2015.07.001.